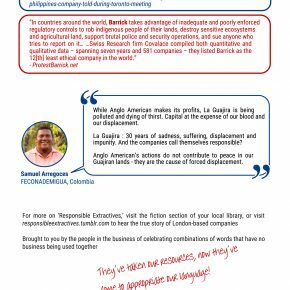 Is the Responsible Extractives Summit, headlined by Rio Tinto, Anglo American, Barrick Gold and others, a cynical PR move or an indication of ‘the ethical best’ an inherently-destructive industry has to offer? ‘It must be a joke,’ I thought. 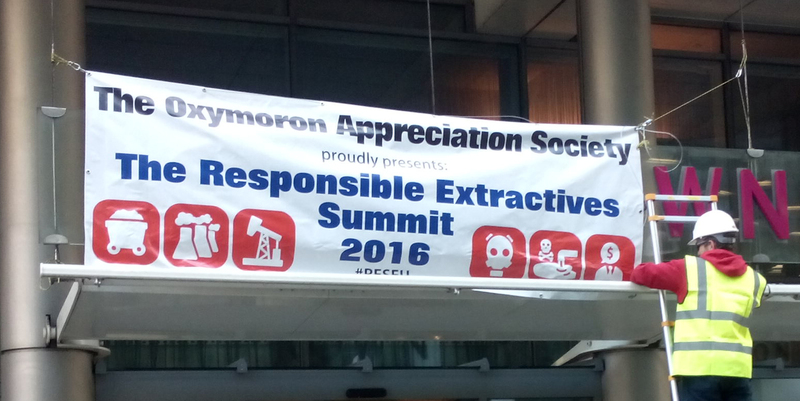 I was already sceptical of the words ‘responsible’ and ‘extractives’ being used so closely together, but it was the keynote speakers that pushed the ‘Responsible Extractives Summit’ from the realm of eyebrow-raising implausibility, to that of the utterly surreal. ‘Who are these white knights of corporate social responsibility?’, I found myself asking, scanning through the microsite for the Ethical Corporation-run mining biz shindig. But what I found left me unsure whether to laugh or cry. 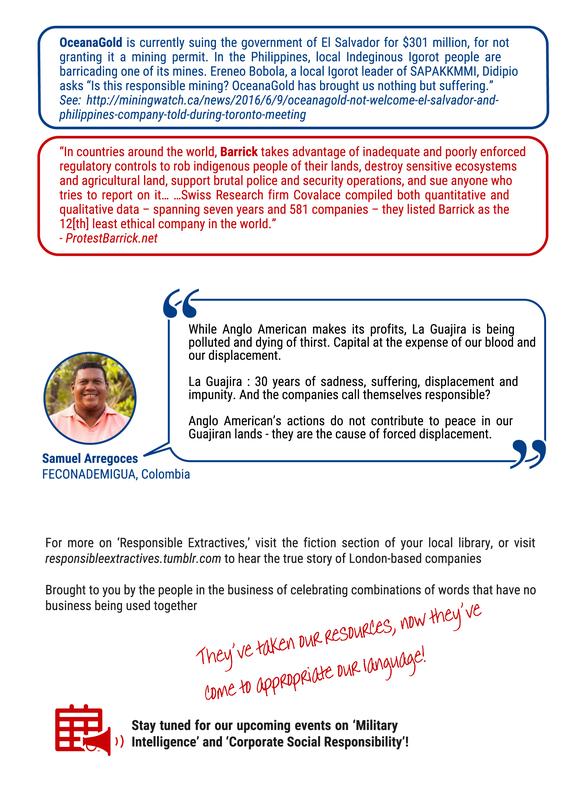 These are the fabled “responsible extractivists”? The ones that conference delegates are paying up to £2,000-a-head to hear impart pearls of wisdom on how to blast giant craters in the Earth, without getting your moral compass bent out of shape? The same companies that have allied themselves with military dictatorships, displaced community-after-community, used every legal channel available to avoid paying compensation to sick former-mine workers, and even managed to make their own Corporate Social Responsibility programmes destructive to those most-affected by them? Yes, it turned out. The very same ones. Samuel Arregoces is a villager from the community of Tabaco, in the La Guajira region of Colombia. Tabaco was bulldozed by the Cerrejón coal mine (co-owned by Anglo American) in 2001, to dig up more dirty coal, much of it exported to fuel UK power stations. Fifteen years on, Tabaco’s residents have yet to be adequately resettled and several neighbouring villages have since been forcibly evicted for further mine expansion. I met Samuel when he was speaking at a series of events in the UK in October 2015. For fifteen years, he has been without a village to call home. But the Cerrejón mine isn’t just in the business of displacing communities – it also displaces rivers in La Guajira, where water access has become an increasingly deadly concern for Indigenous Wayuu and Afro-Colombian residents, in no small part due to three decades of mining. An ocean and a continent away, Rio Tinto are seen in a similar light in Madagascar. Malagasy activist Mamy Rakotondrainibe has come to London on multiple occasions to challenge London-based extractive bullies before. 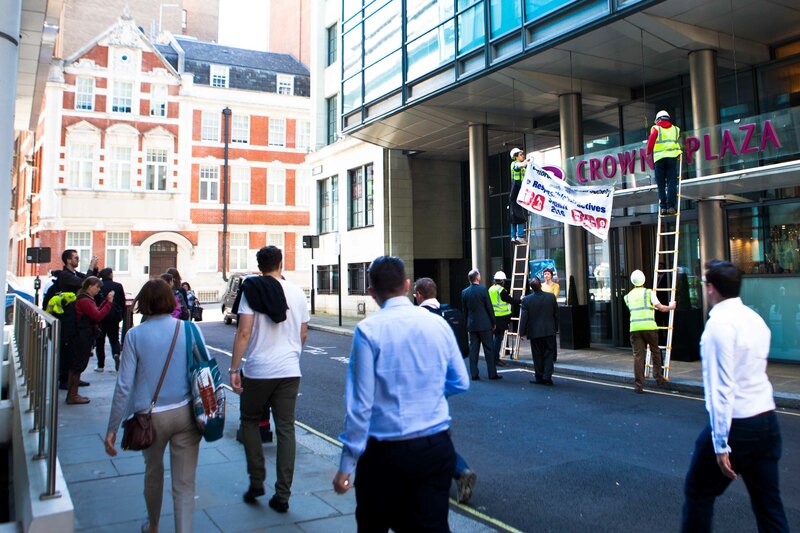 A group calling themselves ‘The Oxymoron Appreciation Society’ re-branded the front of the hotel where the Responsible Extractives Summit was taking place, hanging a banner satirically-declaring themselves the conference’s true presenting sponsors on its opening day. With the names on the bill and a glimpse into the stories above, it’s hard to see the Responsible Extractives Summit in any other light. Terms like ‘ethical,’ ‘sustainable,’ and ‘responsible’ once carried the moral weight to hold an unscrupulous mining industry to account in the public eye. 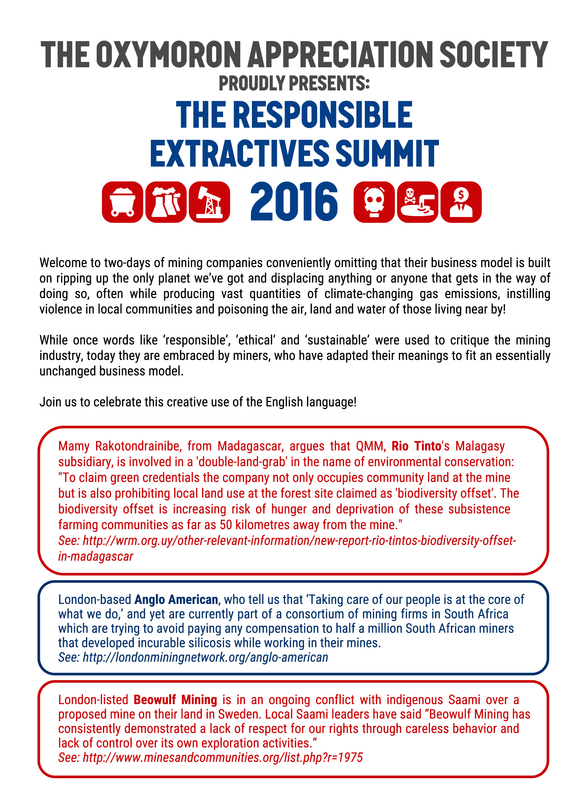 Today, through events like the ‘Responsible Extractives Summit,’ mining companies have taken this language, strip-mined it of any practical meaning and used it to legitimise their own profits. What is clear is that these companies would struggle to find any dictionary definition of ‘responsibility’ that matched their real-world activities. 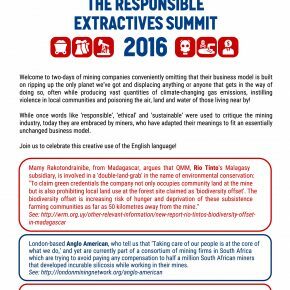 What is less-clear is why events like the Responsible Extractives Summit exist at all. Are they a cynical PR manoeuvre to legitimise inherently illegitimate – but profitable – business practices? Or are these companies truly the best in a failing field, unable to maintain even the most basic of ethical standards in pursuit of their corporate aims? Neither possibility can distract us from a difficult conclusion: that we need to move away from an extractive economy. Immediately. Anything less is complicity in perpetuating the crimes faced by Samuel, Mamy and so many others. The transition won’t be an easy one, but perhaps we can start by banishing this notion of responsible extractivism to the dustbins of history.